Today's technology allows us to give superior pool service at a lower price, with a pool cleaner and chlorine generator. You are all set for our Artisan Service. Don't have one! No problem we will set you up. It may need adjustments to bring it to proper balance. The feeder and pool cleaner is property of H2O Technologies and will be maintained or replaced as needed as long as the pool service continues. A pool expert will visit your pool every week for as long as it takes to get everything tuned in and balanced. All chemicals are charged at about what you would pay at the big box home improvement stores. H2O technologies can replace your the existing plumbing lines and can also install a new automatic fill line, a vacuum line for your pool sweep, a new skimmer, and more. At H2O Technologies we are an insured and bonded Licensed Contractor we have been doing repairs for home owners and business since 1978 that's over 34 years of experience. Pools for Residential or Commercial Properties. 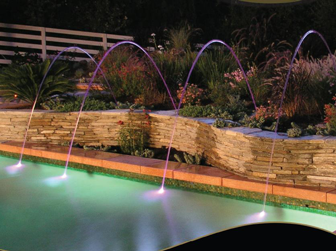 Fountains in your home or commercial properties. 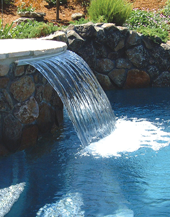 Is your swimming pool, spa, fountain, water feature in need of any maintenance or repair? We can repair and install any pool or spa equipment whether it is at your home or commercial properties: plumbing, heaters, pumps, filters, salt system, and wireless systems is just to name a few of what we can help you with. We can take care of any of your pool, spa, fountain, pond needs. We look at every project as if it is going into our own backyard. H2O Technologies respect and understand the value of your purchase. We want you to be proud that you contracted with us. Our goal is to provide you with the best design and highest quality you will be proud off and recommend use to your family and friends. Imagine turning your existing pool, spa, and backyard into that swimming pool and spa oasis of your dreams. Is your swimming pool or spa water becoming more and more difficult to keep clean? We all know that nobody enjoys splashing around in dirty water. Maybe it is time to upgrade your swimming oasis filtration system. We will install or upgrade with state of the art equipment for your needs. Our experienced maintenance crews in Southern California will on a regular basis: clean your pool, spa, fountains or Koi ponds. Our crew will empty pump and skimmer baskets, test the chemical balance of the water, net all debris from your pool and spa, perform and suggest any repairs on the equipment on each service appointment. We offer our clients a competitive price along with quality workmanship performed in a time efficient manner. What Makes H2O technologies Different? Unlike other companies in the industry H2O technologies has been around for over 34 years and has built a team of service professionals with expertise in every aspect of swimming pool care, remodel, maintenance and pool repair services.